Todd works from home unless he is meeting with a client. This gives us the chance to each lunch together every few days, it's pretty great. Usually our lunch consists of turkey sandwiches with pickles, cheese, and mustard (extra mustard on the side for me please) and some sort of fruit (clementine’s) and vegetable (carrots and cucumbers). Usually once a week I try to make something other than the standard turkey sandwich or leftovers (I eat a lot of leftover for lunch). Last week I made Cookie and Kate's spicy kale and coconut stir fry and I'm obsessed. Todd and I joked that this stir fry was like his bag of potato chips because I could not stop taking bites. I ate the leftovers for lunch the next day and made it again yesterday to share with a neighbor. Hurray for delicious healthy food! Heat a large non-stick skillet over medium-high heat. Once the pan is hot enough that a drop of water sizzles on contact, add 1 teaspoon oil. Pour in the eggs and cook until the eggs are scrambled and lightly set. Transfer the eggs to an empty bowl. Wipe out the pan with a paper towel. Add 1 tablespoon of oil to the pan and add the garlic, onions, and additional vegetables. Cook, while stirring until the vegetables are just tender. Add the kale and salt. Continue to cook, stirring frequently until the kale is wilted and tender. Transfer the vegetable mixture to the bowl with the eggs. stirring frequently, until the rice is hot. Pour the vegetables and eggs back into the pan. Add the tamari and sriracha. Stir to combine and break up any large clumps of scrambled egg. Squeeze the juice of half of a lime over the dish and stir to combine. 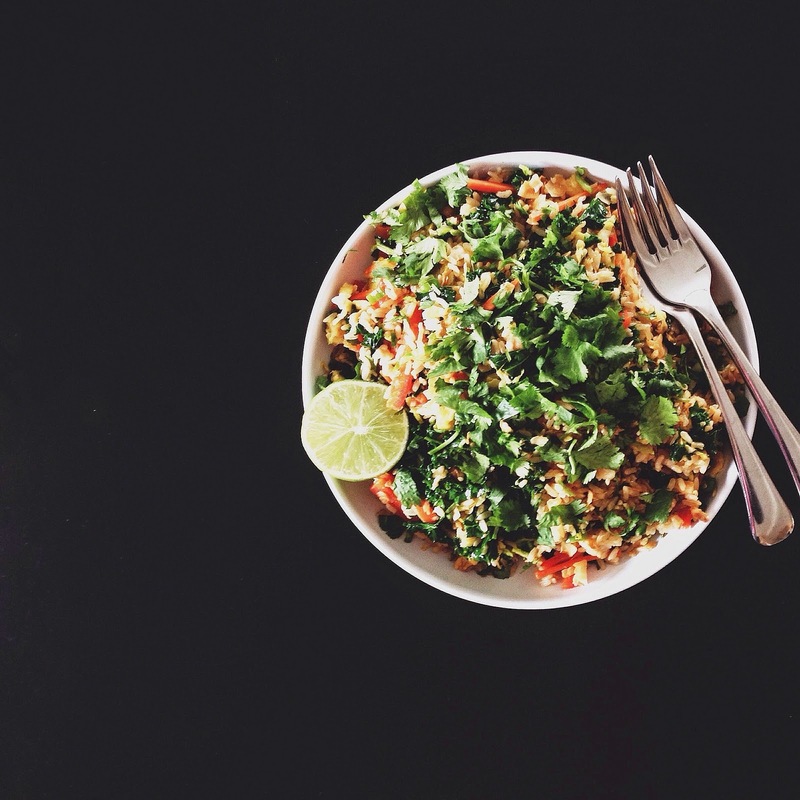 Pour the stir fry onto a serving plate and garnish with fresh cilantro. Serve with lime wedges and extra sriracha for those who like it extra spicy. Preheat oven to 325 degrees F. Grease a 9x5 inch loaf pan and line with parchment with parchment overhanging the edges of the pan. In a large bowl, beat oil and maple syrup together. Add eggs and beat well. Stir in vanilla, salt, cinnamon, and cardamom. Add bananas and mix until just combined. Add baking soda to hot water, stir to mix. Add to the baking soda water to the banana mixture and mix to combine. Next, stir in the flour until just combined. Stir chopped chocolate into batter. Be careful to not over mix. 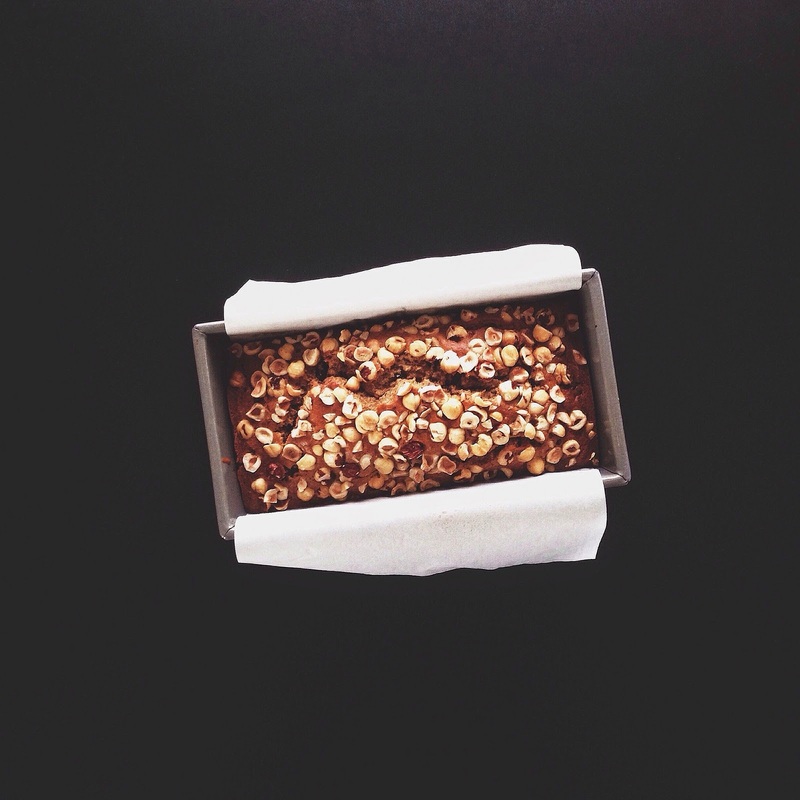 Spread batter into greased loaf pan and sprinkle with toasted hazelnuts. Bake for 50 to 60 minutes until the bread is golden and a toothpick inserted in the center of the loaf comes out clean. Let the bread cool for 5 minutes before removing it from the pan. Let cool for 30 minutes before slicing if you can wait that long (we couldn't).